We absolutely love the podcast Gravy, put out by the Southern Foodways Alliance, and it is a must-listen for foodies. Gravy covers the social history of food in the American South, both past and present. We always learn something new when listening to Gravy, so we were fascinated to learn about the influence of military rations and food technology on civilian food, from ingredients to packaging, which we thought we would share on Veterans Day. If you are looking for a fun, fascinating podcast we can’t recommend Gravy enough. We have been meaning to try Big Jones ( 5347 North Clark Street) for a long time, and when we took a look at their Big Southern menu with elevated takes on lowcountry, cajun and creole classics, we certainly weren’t disappointed! Big Jones itself is very simple and clean, with wrought iron chairs, damask wallpaper and cool marble tables. The dark restaurant that is much deeper than it looks with lots of room for tables – seriously – it just keeps going. Big Jones has a slightly retro vibe, but certainly no kitsch, and that definitely set the tone for the night. For those beverage connoisseurs, there was a huge selection of both American and imported Whiskey and Bourbon, and you can even join a Bourbon tasting club, where you can get a passport to stamp, and when you have gotten 46 stamps you earn the title of “Master Taster.” You are definitely spoiled for choice on other parts of the menu as well. M particularly liked the ability to build your own charcuterie plate. M sampled the Boudin Rouge ($6), a blood sausage he had tried on a visit to Baton Rouge, and tasso ($7), a heavily cured and spiced ham. The tasso came with a side of pimento cheese, made with our perennial favorite, Hook’s cheddar, which was fantastic. First off, we were depressed that there were no biscuits available for dinner, since we will eat biscuits at any opportunity available. The waitress implied that we should have known that, but who doesn’t want biscuits ALL the time (Suggestion to Big Jones: have biscuits available all the time). We tried to fill the biscuit shaped hole in our heart with other sides. First up: cornbread with honey butter ($6). This cornbread come out in its own cute mini cast iron skillet, and was served with shallots, whipped butter and local honey, which was a real complement to the light and crispy cornbread. For another starter, we tried the cornmeal-crusted fried green tomatoes ($8), tasty but not as memorable as the cornbread. We tried to get a sampling of dishes from the menu, and we heard especially glowing things about the fried chicken. The fried chicken, though a little expensive ($23 for a half) was an absolutely huge portion, enough for two: a breast, thigh, wing and drumstick. It also came with a side of chicken and dumplings and collard greens. The highlight of the fried chicken was the delicious buttermilk and cornmeal breading, and the crispy skin, which had been fried in fried in leaf lard, ham drippings, and clarified butter (not for the diet-minded). Though the chicken was not quite as moist as it could be, the juicy crust made up for this minor shortfall. Our other main entree was shrimp and grits ($17), made with heirloom grits dotted with cheese, mushrooms, tasso ham, and butter. The grits were extraordinarily velvety and creamy, but with a very strong tasso flavor, in case you are not feeling bacon-y. We finished up the meal with a decadent trio of homemade gelato: salted caramel, chocolate and the more unusual mamey fruit flavor. We really enjoyed our meal at Big Jones, it was an elevated southern experience that wouldn’t have been out of place in the restaurant scene of Savannah or Charleston. We appreciated the obvious care they put into the sourcing and preparation of their food, and their respect for Southern foodways. Especially on a cold night, it’s nice to be transported to the south. The pronunciation of some words is enough to separate locals from tourists, and connoisseurs from newbies. One of those such words is “Boudin.” Boudin, a rice-stuffed pork sausage from Louisiana, is pronounced “boo-dan” not “boo-deen,” as one might expect. Boudin is found all over Cajun country (you can even take “Boudin Trail” tour), and is descended from sausages found in French Acadian cuisine. Boudin is available in any good Louisiana Cajun restaurant or grocery store, but we think we have found our favorite way to enjoy Boudin – as a late-night Po’Boy topped with pulled pork. We found this particular incarnation of Boudin sold in a stand called Southern Dawgz on the corner of Florida and 3rd in downtown Baton Rouge. The truck is there most Thursday-Saturday nights (until 2 AM! ), and there is a small selection of items, though most everyone is there for the Boudin. You can get a basic Boudin dog, or a “Bleu” topped with blue cheese or a “Heart Attack” topped with bacon. The cookmaster of this particular Boudin stand is Jerry, who is actually from Southern Ohio, and sous chef is from Indiana. Boudin is often sold in fried “Boudin Balls” much like meatballs, but at Southern Dawgz you get them in a form similar to brats. We ordered a smoked Boudin Po’Boy, which was great. The filling was perfectly seasoned, and the Boudin link had a charred snap. However, Jerry upped the ante by suggesting we try the stand’s “Red Dawg,” a Boudin dog topped with pulled pork and a tomato-based BBQ sauce. The pulled pork was a great addition, and contributed even more to the ultimate late night pig out! Being out of the country off and on for nearly 2 years, we tend to be pretty far behind most food trends in Chicago. By the time we go to a restaurant, it has already been written up by everyone and their cousin. However, for once we are able to get somewhere before it has totally fallen off the radar. We had the fortune of visiting one of the hot spots of the summer (complete with outdoor patio): Parson’s Chicken and Fish. We arrived at Parson’s with two of our friends on a Thursday night, which we figured would be a slightly off hour. Fortunately we were right, and were able to get a table for 4 outdoors nearly right away. The atmospheric outdoor setting is a large part of Parson’s appeal. The restaurant itself was a former fast food joint, and only has a few booths. However, the outdoor area in back of the restaurant is pretty huge, and consists of semi-shared picnic tables with striped umbrellas, an open air bar, and whimsical strings of Christmas lights everywhere. The atmosphere is convivial, and there is even a ping pong table to keep you occupied if you wait (which you may have to on most nice nights). The menu itself is pretty focused, and consists mainly of Southern American classics, especially chicken and fish, as the name would imply. The fried chicken is billed as “Amish” and you can get it grilled or fried (of course we chose fried). The fried chicken, which we figured would be the showpiece of the restaurant, was in fact extremely delicious. The chicken had a savory, crispy cornmeal breading, and was fried to perfection, with a piping hot exterior and juicy interior. We ordered a bucket of chicken for the entire table to share ($24 for the bucket and toast), along with a helping of Texas toast (perhaps our eyes were bigger than our stomachs). The bucket contained about 12 pieces of chicken, and the chicken breasts were cut in half for easier eating – though they were somewhat difficult to identify. We also ordered a basket of fried fish ($16 for 6), which we agreed was somewhat less successful than the fried chicken, and was pretty greasy. We also enjoyed the sides: hush puppies ($4) and ceviche ($10). The ceviche was Mexican style – with a tomato-y sauce – it was good but a somewhat small portion. The hush puppies were heartily enjoyed by all – they were particularly light and fluffy – also full of bacon pieces. We finished up our hearty country picnic with a slice of lemon curd and blueberry pie from the inimitable Bang Bang Pie Shop (the pie changes regularly), which was particularly excellent. With pie like that, we hope to visit the pie shop itself soon. Parson’s Chicken and Fish is a great place for a tasty meal on a nice day, and a large part of the charming experience is being outside. Better get there before fall! Once, M didn’t like BBQ ribs. Too many experiences with gristly, fatty, underwhelming spares and baby backs had led him to a life filled with pulled pork and brisket. Not that he was complaining – these are meals for the gods. But on a drive through Asheville, we decided to give ribs one more chance, at a widely praised smokehouse by the Asheville riverfront. A long story short: M likes ribs now. Loves ribs. Craves them. A slab of six ribs at 12 Bones (and nothing else, mind you) single-handedly changed his barbecue life. Like any good rib place, 12 Bones does not give you much time: open only 11-4 on weekdays (or until the food runs out, whichever is first), by the time we arrived at 10:30 there was already a line. We were lucky to be early: there were multiple rub glazes to pick, and at the last minute, knowing the ribs were famous, M decided to opt for a standard 6-bones rack of brown sugar glaze. Among other potential choices was pineapple habanero, but we felt that could have been getting a little too playful if we wanted to get something traditional for our first time. There is something primordial about a rack of ribs that come out on an aluminum plate. No sides, no nothing else. And they did not need anything: the rack of ribs in the background of this photo were easily the best we have ever had – just amazing. Perfectly smoked, all the fat had melted away, leaving behind perfectly tender, well-seasoned, and artfully glazed rack of certified culinary cavemanliness. Extra points for the fun outdoor seating area! Meanwhile, as M was salivating over his rib plate, L was busy on her usual: pulled pork. It was good, but not memorable in comparison to the ribs. A solid, light smoke flavor with a sweet North Carolina vinegar sauce made for a worthy contribution to our meal. Between us, we split cornbread, macaroni and cheese, and cucumber salad as sides. But again, the star here is the ribs: if you have a chance to stop in Asheville, definitely pay a visit to 12 Bones. A side note: while in Asheville, be sure to check out the city’s riverfront arts and antiques district! There is something about BBQ in North Carolina that attracts it to art. Where else can you find an 1960s Illinois Democratic Party pin for a dollar? We absolutely love Southern foodways and Chicago actually has some pretty good options. But since we were in the Southern foodie haven Charleston earlier this year we figured we would find some excellent southern food that would blow our Chicago options out of the water. The only problem was there were so many options! In our research, we found a few names that always came out on top, including Hominy Grill. 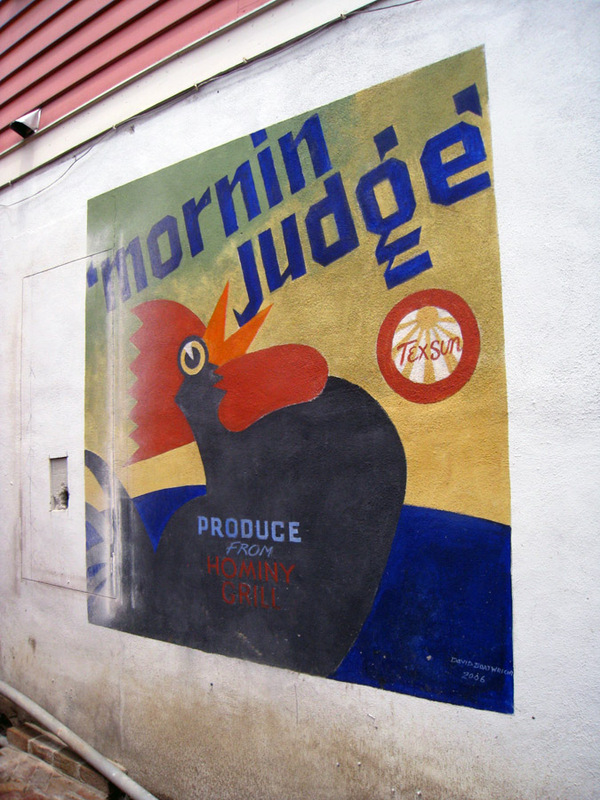 Hominy Grill is located in old red house, covered in vintage sign paintings including one that proclaimed “Grits are Good for You.” Now that is a health message we like. The inside of the house/restaurant was charming, with simple wooden tables, a whitewashed tin ceiling and ever-spinning ceiling fans. Between the two of us we ordered she crab soup ($4.50 for a cup) and fried green tomatoes with ranch dip ($4.25). Though fried green tomatoes seems to be a one of those dishes that always graces a Southern menu, neither M nor I had ever actually had it before. Both the soup and grits came out piping hot. The soup was decadently creamy and the fried green tomatoes were pleasantly tart. Though both of our appetizers were very good, we were most looking forward to the entree. 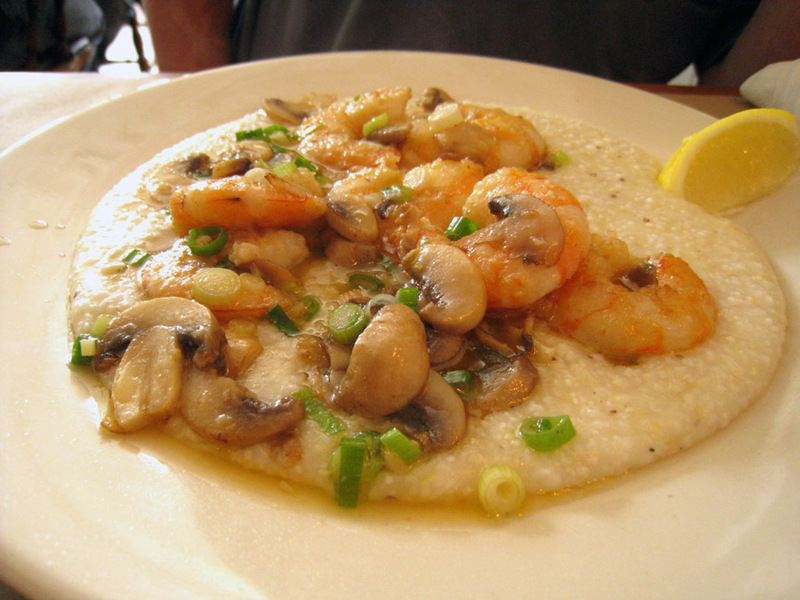 The pièce de résistance was without a doubt the shrimp & grits ($16.95), for which Hominy Grill is justifiably famous. These shrimp and grits were gussied up with mushrooms, scallions and bacon, as well as a little garlic. They didn’t skimp on the shrimp and when they said cheesy – they meant it. The shrimp and grits were phenomenal – we have never had better! We regretted slightly not ordering two orders of shrimp-and-grits, but despite the sign on the outside we are not sure that would have been the healthiest thing to do. Had we been in Charleston for longer I can guarantee we would give Hominy another visit. We found a recipe for their grits in Southern Living Magazine, but I suspect they will not quite be the same. The last leg of our BBQ tour was a stretch from Nashville to Chicago. We rolled into Louisville a little before lunchtime, and we were looking for something to tide us over before we hit Indiana. We had read good reviews about Mark’s Feed Store, and being unfamiliar with Kentucky, we decided to give it a try. The building that houses the restaurant did indeed formerly house a feed store, and is quite an interesting structure, with exposed rafters and a hand-painted sign on he weathered brick exterior. Turns out Mark’s is a mini-chain in the Kentucky area. Mark’s slightly glossy and carefully appointed interior (think Fridays, but with BBQ) was a bit of a change of pace for us, and we were a little disappointed when we found out that they did not in fact smoke the meat in house. We decided to give the place a chance however, since we were facing 200 miles of nothing but fast food chains ahead. The confluence of motorcycles parked in the lot, gave us an additional glimmer of hope. The BBQ was Kentucky style, with a vinegar and tomato based sauce. The main protein in Kentucky BBQ pork, so we both ordered pulled pork sandwiches ($6.99) which came with a side of fries. The pork was tender, but a little dry. Fortunately the table was well stocked with sauce bottles, which we slathered onto our sandwiches (that’s where the roll of paper towels at the table also came in handy). In addition to the basic “red” tomato and vinegar-based BBQ sauce, there was also a spicy variety, and a half-mustard and half-tomato sauce. After Sweatman’s we weren’t impressed by the mustard sauce, but M, being a fan of hot foods enjoyed the spicy variety. Though in the end, this probably isn’t the most authentic place to get some que, we enjoyed our meal at Mark’s Feed Store. It would probably be a very good place to take guests or people who are not up for some of the more rustic joints we visited along the way. As we took our extra-big gulp of sweet tea on the road we bid our BBQ tour farewell. It was a great ride. We will readily admit that we really only found out about Sweatman’s because Anthony Bourdain told us to go there. But that doesn’t mean the trip was any less difficult – literally half an hour from anything, Sweatman’s BBQ lies at an almost un-findable intersection in backcountry South Carolina. Even if you manage to find the place, it is only open Fridays and Saturdays. We had to make a very special trip – an extra few hours of driving from Charleston – just to get there. And it was worth every minute. Sweatman’s makes its home in a large wooden cabin, attached to an equally large barbecue smoker. That fact should be a dead giveaway as to how the place operates: for two days each week, ten hours a day, Sweatman’s pumps out huge amounts of perfectly smoked pork – and only pork – drizzled with its famous mustard-based barbecue sauce (central South Carolina’s specialty). As a result, Sweatman’s can be packed during peak hours, with patrons coming from all over the state (much like us) for a generous BBQ helping. The service speeds this along: one dry-erase menu gives the limited options (sandwich or buffet, both pork and both with mustard sauce) to a fast-moving line of customers, whose orders are rung up on an aging cash register. L ordered a pork sandwich, M the buffet. For dessert, a cup of the famous banana pudding – described elsewhere as the “best 63 cents you can spend,” its creamy goodness definitely lived up to the hype. And so did the barbecue. Generally, when one place receives almost universally positive reviews, as Sweatman’s does, you almost have to be skeptical. Were we being set up for disappointment? We hoped not – and decided to see if Sweatman’s famous pulled pork stood up to reviews. Suffice to say the lines are for a reason. The barbecued pork by itself, both for the buffet and the sandwich, was impressively lean and fresh. It managed to be filling without being heavy, and lean without being dry. Sweatman’s mustard sauce is definitely different than our previous narrow perceptions of a BBQ sauce – it was shockingly bright yellow and packed a mouth-puckering mustard and vinegar punch. The extra mustard sauce we picked up was probably not needed, but was definitely a welcome addition poured over the barbecue when we went back for (free!) second helpings. All washed down with a free cup of sweet tea, this was a South Carolina meal at its finest. Satiated and full after an hour of eating, we left the packed dining hall and walked to the carry-out entrance (equally packed with clients) to pick up some of the mustard sauce for the trip home. It stays good forever, and L and I are still using it bit by bit on chicken, pork, and whatever else strikes our fancy. Old Plantation has all the makings of being a good place for BBQ – an off-the beaten path location, billowing smoke rising from the smoker and a crowd, even on off hours. We stopped at Old Plantation on our way back to Chicago, after breezing through Georgia. Old Plantation is located a bit off the beaten path from the city center of Chattanooga, but the tiny wooden building stands out due to its blue exterior. Inside, there isn’t much room for more than a counter to order at and a flattop stove. Lucky for us the line wasn’t too long, and neither was the wait. We took the time to peruse the menu, which included Pork or Beef shoulder sandwiches ($6.00) and even Barbecue nachos ($6.00) and hot dogs ($4.00). You could even order the Que by the pound, which speaks to its cult following. M and I shared a shared a pork shoulder platter ($9.00). However the awesome BBQmaster behind the counter gave us two rolls admonishing M to “not let her eat it all.” The platter came with two sides – a tangy housemade cole slaw and a heaping helping of baked beans. There was no seating available at the picnic tables outside, so we set off on the road, eventually stopping to eat at the UT-Chattanooga campus, which was nicely set up on a hill. We found a bench and dug into our platter. The BBQ was a tangy Memphis-style, with a nice kick of spice. t was thicker and richer than other sauces we had tried, and it was so good we ended up sopping every drop up with our bread. However, we were divided on the chopped pork. When they said chopped pork they meant it -everything comes right along with the meat: fat, cartilage and all. While I know that’s what one should expect from chopped pork, I had been spoiled by the lean pulled pork on the rest of the trip, though M did not seem to mind. One thing we regret though – was missing getting a bottle of BBQ sauce to take home with us. We spent one of our first days in SC visiting the Penn Center, a Gullah museum and research center dedicated to the African-American populations of the coastal lowcountry. The Gullah cultivated a unique culture with a distinct language, and of course a distinct cuisine, so we figured if we were in Gullah country we should definitely try some Gullah food. Gullah Grub is located in an old wooden house on a somewhat busy road, right before the turnoff that leads you further out to sea (and the Penn Center). There’s no AC, but the place managed to stay relatively cool, courtesy of overhead fans working double time. As we entered we were greeted to a cozy interior dotted with knickknacks and mismatched tables and chairs – reminiscent of the living room of a southern Grandma. Perhaps best of all, as soon as we sat down, a plate of free cornbread (and excellent cornbread at that) was plunked down in front of us. Both of us ordered Sweet Tea ($2) to accompany our lunches, which came served in Mason jars with unlimited refills. The menu consisted of mainly Southern favorites. Fried chicken and BBQ ribs seemed to be popular choices, but the menu boasted some more unusual items as well, including a fried shark-n-shrimp dinner ($17.50). Sharks are not uncommon in these coastal parts, we suppose. Not in the mood for shark, L ordered the BBQ Chicken ($8.50). It came with a side of potato salad and a generous slathering of red, vinegary Carolina -style sauce. Despite the heat, M was feeling the soup, and he asked our waiter if he would recommend either the gumbo or the She Crab Soup. He replied that “Well, they are both good, but the gumbo is healthier.” M therefore, made a beeline for the she-crab soup ($6 for a medium bowl/$9 for a large). True to our waiter’s word, the She Crab soup was creamy, filling and delicious. We had heard that the service was especially slow, however, our meal moved along at a good pace, even with a big party table ordering right ahead of us. The vibe of our late lunch was laid back and friendly, the food was good and this was the only place we’ve ever actually had drinks out of jelly jars. Eating in the little wooden house, sipping on Sweet Tea, we felt completely transported. Rolling along on our roadtrip, we finally reached our destination – Hilton Head, South Carolina a resort town by the sea. And since Hilton Head is by the sea, there are no shortage of seafood joints of various stripes. Hudson’s is one such seafood joint, and it fits somewhere between a seaside clam shack and a Chili’s, if you can picture such a place. We arrived at Hudson’s with a group of 14 – and before being seated we hung around on the seaside patio, where a man with an acoustic guitar was playing Jimmy Buffet cover songs. Next to the outdoor patio, and flanking an outdoor bar, was a gigantic pile of clamshells (below). So I guess you could say the place was a bit touristy. But as tourists, who are we to complain, especially as we were treated to a lovely sea-side sunset. The interior of the restaurant continued the nautical theme, as did the menu, which was printed to look like a newspaper. We figured this place, if anywhere, was going to have some good seafood, so we decided to go all out and order nothing that could be found on land (a rule disobeyed by other members of the party – who were treated to some lackluster steaks). Before we ordered, several free baskets of hush puppies were placed on the table, which we quickly devoured. We started off with Seafood Gumbo ($4.25) and a Crab Cake (below, $10.99). Both appetizers were good, with the gumbo being pleasantly richer and spicier than expected. However, for 10.99 we expected the crab-cake to have less veggie filler and more crab. For our mains we ordered Broiled Shrimp ($17.50) and Stuffed Flounder ($20.99). both the shrimp and fish were obviously fresh, and were well cooked, but we found both to be too lightly seasoned. The little plastic cups of condiments were also a bit out of line with the price point. Of our meal, the gumbo was a standout, as was the house-made Key Lime Pie ($6.50), which was a great way to finish the night. Service was actually very good, and it seemed that they had experienced their share of 10+ crowds before. The food was decent, but we found it all to be a bit overpriced. But in the end, the real reason you come to place like Hudson’s is not the haute cuisine. As they say in real estate, location is key, and that is probably where Hudson’s shines the most. You’re paying a premium for the ocean views and the inimitable mountain of clamshells! On our roadtrip through the south, we made lots of fine foodie stops along the way. It probably shouldn’t properly called a BBQ tour since we ended up sampling lots of other tasty, non-slow-cooked or sauced treats as well, from pizza to seafood. But BBQTour2K9 had such a nice ring to it, we couldn’t resist. So don’t be surprised if some of our BBQ finds…aren’t really BBQ. Reagrdless of cuisine, join us on our trip through Kentucky, Tennessee, South Carolina and Georgia! So obviously, the ‘south’ is not a country, but it does have a rich culinary tradition of its own, so we’re comfortable including it on ETW. Well, mostly because it’s a darn tasty cuisine. Our latest adventure into Southern Foodways is Smoque Barbecue. Smoque has gotten a lot of press, so we went in with some skepticism. Could it really be as good as all this hype? Short answer = yes. We arrived at 11 AM on a Saturday, right when Smoque was opening. We could tell that they did a brisk takeout service, from the fact that there was already a line, and someone had called in an order of 20+ sandwiches to go. The menu itself is probably what you would expect from a BBQ place – the choices of meat are Pulled Pork, Brisket, Chicken and Texas sausage (which they began to make this Summer). They also have 2 types of ribs: Baby back and St. Louis. What was interesting though was that you could order small side orders or some of the meats – so if you felt like sampling something, but didn’t want a whole sandwich or a platter you can do it for $3. A ‘taste’ 1/4 slab of ribs is $4. For lunch we opted for a Pulled Pork Sandwich platter ($8.95) and Sliced Brisket sandwich platter ($8.95). Each of these came with one side as well as homemade cole slaw. Interestingly, even for a take-in order, though there is some sauce on the sandwich, it isn’t slathered, and the order comes with a cup of the BBQ sauce came on the side. At first we were skeptical, but it makes a lot of sense since then you can add as much as you want and the roll doesn’t fall to mush. In the end we ended up using most of the cup anyway, since Smoque’s stock in trade is its peppery, vinegary, yet semi-sweet BBQ sauce. Delicious – not too too sweet, but not to vinegary either, I don’t know what they do, but they’re doing it right. Onto the sandwiches – both were amazing. As you can see, the portions were generous. One of our sides was baked beans – which were excellent – turns out that they cook them in with the meat and BBQ scraps – so they have some nice smoky flavor. The mac and cheese was also delightfully creamy and decadent, and we would definitely recommend it to Mac and Cheese aficionados. The one disappointment was the small peach cobbler, which was only so-so ($1.95). The brisket, which you can get either sliced or chopped is uber-tender and comes with a nice smoky, crusty exterior. My sister, who doesn’t even like BBQ, loved it. the pulled pork sandwich though, was my favorite. The pork itself is light pink from the smoking and practically melts in your mouth. We were raving about our food for days. Truth be told though, the location is pretty random – it’s right off of the Kennedy expressway, and tucked into an unassuming building in a mostly residential area. However, a few weeks after our maiden voyage, we made the venture again to get takeout. Now I understand why they do such a brisk takeout business – it tastes good even after an hour car ride! So if you can make the trip over – you should try to do it – this is some good BBQ.